This blog is an edited version of an article that first appeared in the magazine, Creative Teaching and Learning in Spring 2013 and is reprinted here with their kind permission. It outlines the first steps into an imaginative-inquiry context that could be used as a topic for a Key Stage 2 class studying the Roman invasions and settlement. The full planning for this Unit can be found on the Planning section of our website. I have updated it for this blog, including the new Programmes of Study for Curriculum 2014. This unit, The Roman Box, uses the mantle of the expert approach. Mantle of the expert has always been an enigmatic approach, not least because of its name, which is hardly catchy, but also because it seems to contradict many preconceptions of how a classroom should operate. Some have called it nothing more than a drama convention, others like to label it as a return to progressive, laissez-faire education. The truth is mantle of the expert resists easy analysis and is difficult to pigeon-hole. It is based on an understanding that knowledge, skills and in-depth understanding are acquired, applied and developed in meaningful contexts that become familiar to the students over time. that create opportunities for curriculum teaching and learning. However, underlying this simple structure is a sophisticated pedagogic approach that incorporates drama and inquiry to create multilayered narrative threads, complex power relationships and dynamic learning opportunities. For more details on moe please visit: www.mantleoftheexpert.com and read Viv Aitken accessible introduction. This article is a step-by-step plan setting up an imaginative-inquiry context. It starts with a straight-forward inquiry using a painting to establish the historical background to the work. This creates an opportunity for the class to step back into the past and into the world of the context through the use of various drama conventions. Finally the article outlines how to build an expert team using the children’s ideas and knowledge. The imaginary context begins with a farmer finding of an ancient Roman security box while tending his field. The box has lain undiscovered for 2,000 years, originally buried during the Iceni revolt following the Roman invasions of AD43. By using the box as a bridge into history the context is further developed by the children recreating the dramatic events surrounding its burial. It then returns back to the present as the children adopt the expert point of view as a team of archaeologists, working first outside the fiction to invent the objects hidden in the box and then working inside the fiction as the team interpreting the objects historical meaning. To make the planning steps easier to follow I’ve divided them up into three discrete sections of approximately one hour each. These can be taught either separately or continuously. Once the context is established it can then be used to create opportunities for learning across the curriculum. On the full planning page you can find both a Pdf and an editable Word copy of the planning. The Pdf copy includes a mind-map detailing some of the suggested cross-curricular links and activities that can be developed using this context. For many of the students in your class this might be the first time they have studied the Romans and the Celts. It is likely some of them will have a bit of background knowledge, but for others it will be an entirely new subject. As a teacher I resist as much as possible telling kids stuff. For one reason, it’s too easy for them. For the second, I’ve noticed they don’t really listen until they are interested. When I’m starting a new area of study I concentrate first on getting them actively engaged in the subject, asking questions, making connections, and drawing conclusions. Once this happens then they a more likely to be receptive to new information. To make this work I need to choose a resource that will grab their attention and, at the same time, give them a wealth of new information. Stories can sometimes do this, film, photographs, and first-person interactions with an adult-in-role. 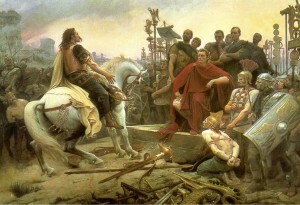 These are all useful strategies but for this context I’ve chosen a painting, ‘Vercingetorix Throws Down his Arms at the Feet of Julius Caesar” by Lionel Royer painted in 1899. I like this painting a great deal because it is full of dramatic tension and captures wonderfully the moment of triumph and defeat that lies at the heart of the Roman invasions. However, it does have drawbacks. The first, and most obvious, is it was painted nearly 2,000 years after the events and is merely an artist’s interpretation. The second is the Celts in the painting are a different tribe from the Iceni, in a different country. Nevertheless, the painting’s advantages (in my opinion) outweigh its disadvantages and I’ve used it many times with children of different ages who have all found it stimulating and exciting. The students might try to guess what is happening in the painting. If they do, acknowledge their efforts but ask them to hold back on those thoughts for a while and just to describe what they can see as accurately as possible. Sometimes this can take a little while, but it is an important step because you want them to really ‘look’ at the painting and not yet start interpreting it. As the students work help them to use precise language, as if they were describing the events in a book, without the reader seeing the painting. Once you feel everything in the painting has been described (and before it becomes boring) move onto to the next step. “Um, I see. So you think this man might be the king’s brother. Is he hoping to free him do you think?” etc. Give the students the opportunity to ask you questions. Be honest about what you don’t know and don’t make things up. It is important they can use you as an accurate historical resource. You can find all the information you need on Wikipedia. For this next step you will need some post-it notes, ideally two different colours. Your aim is to begin a discussion about the contrast between the straight, angular, lines of the Roman designs and the more rounded, organic, shapes of the Celts. Encourage the students to ask questions and make inferences about the two different cultures and what was important to them as people. By the end of this session you are likely to have the makings of quick wall display with a copy of the painting surrounded by different coloured post-it notes recording the children’s new knowledge and questions. Wait a moment and see if the students say anything. If they’re getting interested they might start making some suggestions. Give them a little time to think, if they don’t start to speculate then guide them along, however try to avoid leading them or being ‘teachery’. This is a sort of ‘fishing’ exercise. You are not after the right answer, you just want to draw the children out, giving them time and opportunity to speculate. Don’t worry if their ideas seem unlikely or fanciful, as the story-teller you can always get the narrative back on track and if someone does start to make the right connections then you have the perfect in. Again, give the students time to talk and speculate. Go carefully, this is all about negotiation and judging the right moment, the students don’t want to feel as though you are playing them along. They might start to join everything up, but don’t be disappointed if they don’t. Up until now you have been holding back on information (in the same way you did with the painting inquiry) giving the children the opportunity to ask questions, make connections and imagine possible events. In this next step you will use an adult in role (AIR) to shift the inquiry from the classroom space into an imaginary historical space and build a contextual inquiry through the use of dramatic conventions. “I just going to ask Mrs Brown if she would help us out. What we would like to see Mrs Brown is the moment just after the box was buried, but before the villa was burnt down. Obviously the people who burnt down the villa didn’t discover the box, because its here! But there might have been a moment when they were outside trying to get in. We’d like you to help us with that. OK we’re just going to watch as Mrs Brown gets ready. The adult then takes a position crouched on the floor, next to the box, her head down. This is a convention of drama where the role is depicted as frozen in time, like in a painting or a statue. The children have permission to stare and make observations and the role will not react. After the class have had time to talk and the time is right you can bring the role to life with a touch on the shoulder. Starting a new convention where the person in role will listen and respond as if they can hear what the children are saying even though they are not with them. The children themselves are outside the fiction looking in, the convention gives them the opportunity to question the person inside the fiction without having to participate. It is an extremely useful teaching strategy as it allows the person in role to give important information (including curriculum knowledge) to the class without it feeling like a lesson. The house is being attacked and they are outside, she can hear them thumping on the door, screaming. They’re climbing on the roof. There’s no way out. When asked she should tell the children the attackers call themselves the Iceni and give them some information, she might apologise for not knowing much. She has buried the box to protect the things inside. They are precious, family things, and she doesn’t want the barbarians getting hold of them. Her husband is a general in the Roman army, he is away fighting the war, and her eldest son is with him. In this next step you will use a further convention to help the children step into the fiction, joining the woman either as members of her household or as the Iceni warriors outside. Be careful to take this slowly. As each of the volunteers makes themselves known ask them to say who they are and to join the AIR in the picture. Ask the rest of the class to watch and interpret their choice of actions. Are they standing close? Are they worried about themselves more than the woman? Are they being protective? Etc. In this way the children will create a tableau, a moment trapped in time, just before the Iceni broke into the house and these people’s lives were changed forever. It is unlikely all the children will volunteer to be members of the household and you will be left with a group sitting and watching those now in role. These will soon join the fiction, but be careful they might be a bit worried about being stared at. Make sure the students feel safe and protected. The aim is to have everyone involved, but not scared. The remaining children can now choose between representing either the Iceni warriors or the neighbours of the Roman family. Allow them the opportunity to change role if they want to at any time. Be careful not to let things rush ahead at this point. Step outside the fiction and talk to the children. ‘I wonder what the Iceni warriors shouted?’ They were angry. Terrible things had been done to them, to their people, to their queen. But the people in this house aren’t soldiers, they are ordinary people, children and servants, try and hold the moment to give the class the opportunity to think and reflect. Remember they are representing the people in the fiction, not being them. This is a chance for the children to experience in a small way something of what it might have been like, but they do not have to agree with the actions the Iceni took. Throughout this inquiry give help and support to the students and give them opportunities to help and support each other. The idea is not too ‘load’ them with the guilt of the people they represent, but rather to create a dramatic situation that will create different points of view and different attitudes. The use of the conventions can help the students to pull back from the events themselves and to re-interpret them from the distance of history. Once the dramatic-inquiry is over bring everyone together again. “What did you make of that? Did it have a sense of authenticity? I mean could you imagine it happening? “What did you make of the Iceni warriors? And the neighbours, I wonder if there was anything they could have done? All along during this monologue it is important to be slow and thoughtful, as if the thoughts are just coming to you as you speak. Be patient and give opportunities for the students join in with thoughts and ideas of their own. You will need a selection of books and pictures out on the tables. There are many good topic books on the Romans, but you might also want to make up a collection of fact sheets. Once the objects are drawn collect them together on the evidence table. You can extend this activity by creating (with the students) the other tools and equipment used by the team. Alternatively, you could bring in real equipment: gloves, tweezers, magnifying glass etc. Brilliant. Just what the doctor ordered!